Picture hanging systems are an increasingly popular choice for public buildings and homes. That is not a strange development: with a hanging system, wall damage is a thing of the past. 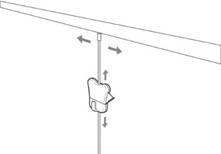 Moreover, hanging systems are suitable for many different wall objects. 1. A narrow aluminium rail is mounted on a wall or ceiling. 2. A cord is hooked into the rail. 3. A hook is slid over the cord to the desired height. 4. An object can be hung from the hook. • No more drilling, ever. • No costs for wall mending or -maintenance. • Easy to use for everyone. • One purchase, a lifetime of profit. • Applicable to every type of wall or ceiling. Sale of hanging systems proceeds via STAS picture hanging systems BV. STAS is a sister company of Goelst NL and has over twenty years of experience with the development and distribution of hanging systems for various wall decorations. STAS minirail If you're looking for elegant, barely noticeable picture rail, then choose the Goelst minirail system. The monofilament cord is barely visible and, in combination with a smart spring, can bear a load of up to 4 kg and up to 15 kg per cord with a zipper. 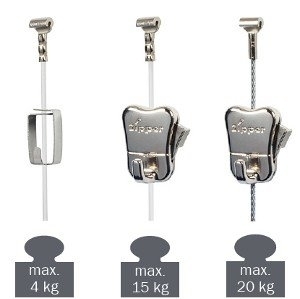 The steel cable is suitable for hanging heavy wall decorations with the zipper - up to 20 kg per cable. Both in the health care sector and in the business community, but also increasingly at home, wall decorations get exchanged regularly. This usually results in a pockmarked wall. With Goelst picture hanging systems, exchanging a frame is as easy as pie. And your walls remain intact. Think of the savings!